A QML example about displaying NFC Data Exchange Format (NDEF) messages. The main.cpp holds the application logic to load the main view stored in the corkboards.qml file. The first time the NearField QML type is instantiated, the Component.onCompleted handler will start the NFC polling process. The onMessageRecordsChanged handler parses NFC Messages that are detected by the NearField component and builds up a data model that is passed into the ListView. Additionally, every time the NearField manager stops the polling process, the onPollingChanged handler restarts it. The ListView component takes a ListModel as parameter (built from the NFC records). The view of each of the items of the model is defined by the Mode component (its implementation details can be found in the file Mode.qml). The data model consists of a list of corkboards. 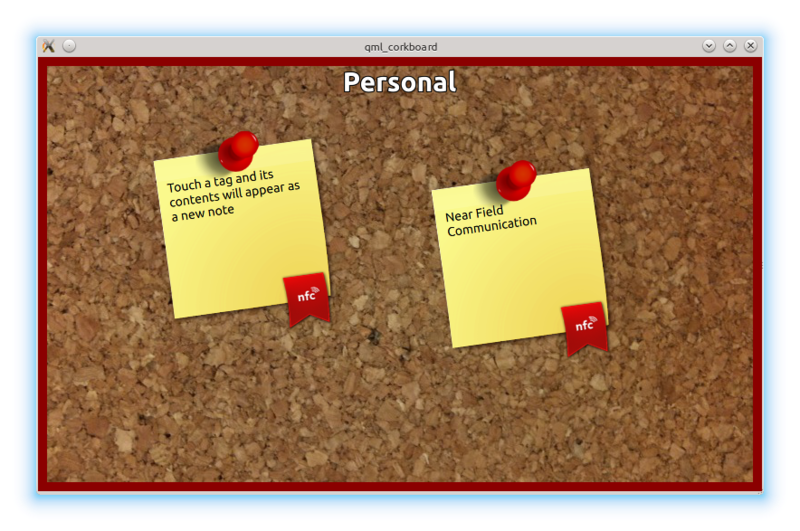 Each corkboard can display multiple NFC text message records. Every text record that was read from an NFC message, is represented by a sticky note with its own position on the display. Initially the position is set randomly. The text on the sticky note is set on a TextField.